As you may know, the third season of Sci Fi’s reimagined Battlestar Galactica ended with some startling revelations. 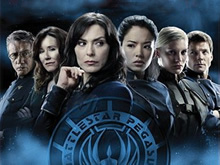 We learned that four regular characters were actually Cylons and Starbuck (Katee Sackhoff) miraculously returned and claimed to have been to Earth. Soon afterwards, fans were dismayed to learn that the rumors were true. The fourth season would be the show’s last. It was going to be tough to wait until the usual January kick-off of new episodes. It now appears we’ll have to wait even longer. The first half of Battlestar’s fourth season will now debut 10 months after the finale of season three, sometime in April. Why the delay? Since production on the fourth season began months ago, it seems like it’s simply Sci Fi’s choice of scheduling. In the meantime, a two-hour movie entitled Battlestar Galactica: Razor will debut in movie theaters on November 12th in New York, Los Angeles, Philadelphia, Chicago, Boston, San Francisco, Dallas and Seattle. Two weeks later, on November 24th, you’ll be able to watch the movie on Sci Fi. An expanded version will be available on DVD soon after that. Razor tells the story of Admiral Cain (Michelle Forbes) and the Pegasus crew before they joined up with Galactica. That story will be told via flashbacks so the regular Battlestar crew will appear in the film in the current day footage. 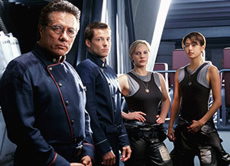 Though most of the movie’s events take place in the past, they’ll play a significant part in Battlestar’s fourth season. It’s interesting to note that, prior to the current version of Battlestar, Glen A. Larson (the creator of the original series) had proposed a feature film that centered around the Pegasus. Lucy Lawless will return to the series as the number three Cylon. When last we saw her, she’d been deactivated and put into cold storage. Lawless’ character will be back for episodes 10 – 13 and will play an important role in the series’ final season. Though nostalgic about the series’ ending, Bamber is glad that Battlestar will have a proper finale. He said, “I think it’s a good time. We’ve been saying from the very first season that the most important thing is to be able to finish this story in a way that is up to the people that create the story. . . the story begs an ending. This is the first and foremost thing.” Stay tuned! This is B.S. How can they make people wait THAT long?